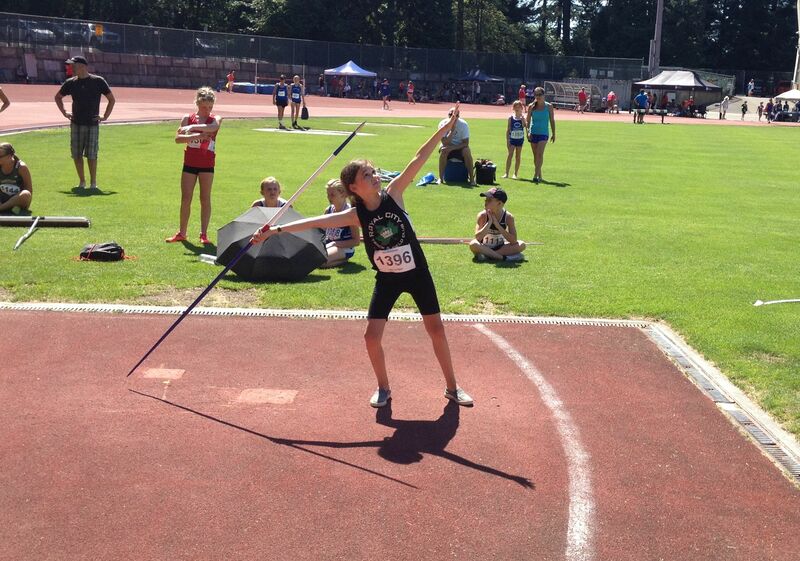 Royal City Track and Field Club athletes medaled well at the recent Trevor Craven meet, hosted by the Norwesters at Swangard Stadium in Burnaby July 4-5. Overall, 22 athletes turned out to compete from RCTFC: 32 medals were won and more than 50 top 8 performances were accomplished at the meet. In the 16-17 year olds: Lauren Vanee won gold in javelin and bronze in 400m hurdles and Emily Chilton won gold in the 800m! For 14-15 year olds: Grace Fetherstonhaugh won gold in the 1500m steeplechase and silver in the 1200m; Jenevieve Patry-Smith won gold in javelin, silver in shot put and bronze in hammer throw; Brianna Bates won silver in javelin; Emma Stewart-Barnett won 7th in long jump; Finnley Cookson won gold in the 2000m, silver in pole vault and 8th in 300m; Shea Janke won silver in 2000m and bronze in 1200m; Gavin Fan won 4th in 1200m and 5th in 800m and Max Jones won gold in pole vault, 4th in 200m hurdles and 6th in long jump. In the 13 year old category: Lauryn Savela won gold in pole vault and silver in javelin; Sabine Girt won silver in 1200m, bronze in 800m and 6th in 80m hurdles; Emma Dolman won bronze in 1200m and 4th in 800m and 5th in 200m hurdles and Lauren Sidhu won 5th in 300m. For 12 year olds: Riley Storms took bronze for the 200m, 6th for 800m and 7th for 80m hurdles and Hannah Sidhu won 4th for 300m and 7th for 200m. For 11 year olds: Katelyn Stewart-Barnett won silver in 1200m and 800m, bronze in high jump and 4th in long jump and javelin and Cameron Dewith won bronze for 1000m, 4th for 60m hurdles and 5th for long jump. In the 9 and 10 year old categories: Nicole Blatherwich won a pair of bronze medals in shot put and 60m hurdles and gold in javelin; Katherine Martin won silver in high jump and javelin and 5th in long jump; Kenan Burrows won 5th in 600m and 7th in shot put and Markus Savela took silver for 600m and long jump, bronze for 100m and 5th in shot put!